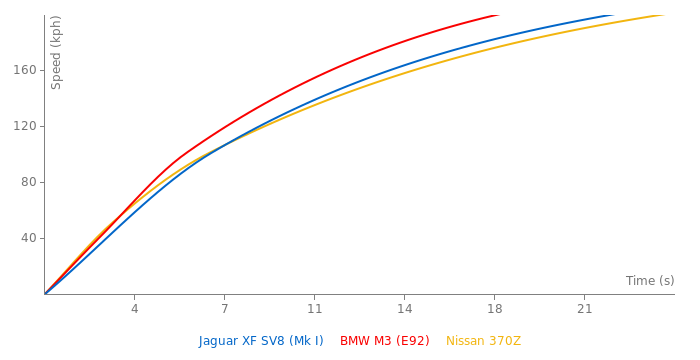 Stock Jaguar SV8XF from 0-177 ( 110 mph) in only 12.4 second !! same as CLS63 AMG !!! Like I said above, 416 PS is the EEC rating and 420 hp is the SAE rating. Read the small print found on technical specification on the electronic brochure. 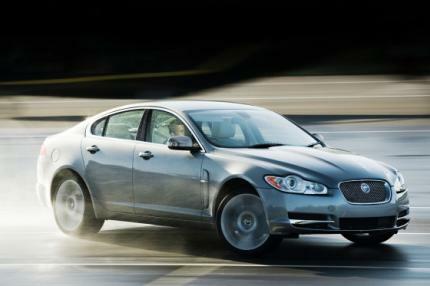 The fact that there are tests which shows this car can do a 0-60 mph (0-96 km/h) time of 4.9 to 5.0 seconds which is better than Jaguar's claim of 0-60 mph (0-96 km/h) time of 5.1 seconds suggest that it's certainly capable of doing Jaguar's claim 0-62 mph (0-100 km/h) of 5.4 seconds. This car's 0-62 mph (0-100 km/h) should be 5.4 seconds. There are tests which shows this car can do a 0-60 mph (0-96 km/h) time of 4.9 to 5.0 seconds which is better than Jaguar's claim of 0-60 mph (0-96 km/h) time of 5.1 seconds. Also, it should be 420 hp. 420 hp is the SAE rating while 416 hp is the EEC rating.